Crude oil is sticky stuff and often clogs filter membranes and other equipment used in the oil and gas industry. To address this problem, scientists at the U.S. Department of Energy's (DOE) Argonne National Laboratory have developed a novel approach, which will prolong the lifetime of key industrial equipment. The new invention consists of a type of coating that produces thin films of water-loving, oil-repelling molecules on the surface of filter membranes. These metal oxide molecules grab onto any loose water atoms while resisting oil. To scientists, these twin properties are known as hydrophilicity and oleophobicity. "One of the best ways to clean oily water is with membranes," said Seth Darling, Director of the Institute for Molecular Engineering at Argonne. "The problem is that the oil sticks on the membrane and clogs the holes until the membrane stops working. Today, if people have an oil-fouled membrane, either they replace it or they try to clean it with harsh chemicals to wash away the oil." The scientists used a method called atomic layer deposition, which uses chemical vapors to deposit a very thin coating of the metal oxide on all of the filter membrane surfaces. They experimented using different metal oxides on off-the-shelf commercial polymer membranes to find which ones worked the best. The team published the results in ACS Nano on August 14. Atomic layer deposition itself isn't new, but it's never been used this way to modify membranes before, Darling said. "It's kind of cutting edge," Darling said. "The coating is just a few nanometers in thickness. If the coating were thicker than this, it would close off the tiny pores. What you want is a minimal change of the pore structure, but you want to change the chemistry of the substance lining those pores." To create this layer in the past, people tried to attach nanoparticles to a membrane by flowing them through it or growing them on it. But particles tend to get ripped off as water flows through those systems. Atomic layer deposition is different because the metal oxide film, in this case, forms strong chemical bonds with the polymer to which it is adhered. In the atomic layer deposition process, the membrane is exposed to a sequence of vapors that stick molecules together, forming covalent bonds with the polymer. "Some polymers bind more easily than others, and some repel oil while others do not," Darling said of his group's process working with a variety of metal oxides. "At this point, we have a pretty good sense of which ones work and why." Tin oxide and titanium oxide formed the tightest bonds with water molecules, capturing them and layering them across the surface. 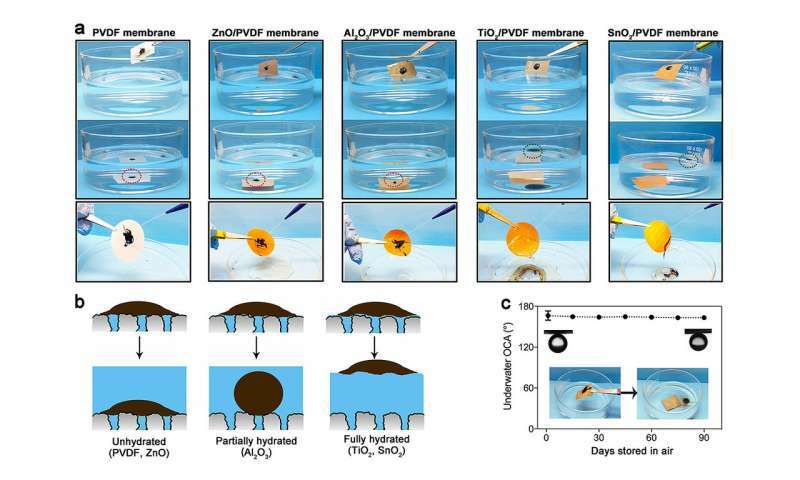 "When oil contacts the membrane, it will stay separate because it flows over the water layer," said Hao-Cheng Yang, a postdoctoral researcher working on the project. Fouled membranes can be a costly hassle for the oil and gas industry. For instance, when oil companies replace clogged filters during the hydraulic fracturing process, they have to shut down their equipment to make the change. Oil-resistant membranes like this could significantly reduce the need for both filter replacement and the downtime it creates, said John Harvey, Argonne's business development executive handling the technology. "Just from my knowledge of the oil and gas sector, if we could make a membrane that performs to even a fraction of what we've seen in lab testing, it will be a phenomenal improvement over what's available now. That represents a huge savings," said Harvey. Another problem in the industry involves the water used in fracking, which often returns from the ground with oil, salt and other contaminants present. Contaminated water cannot be returned to the ground if it poses a threat to aquifers, so the industry often must find another way to dispose of it. The membranes used now can remove the other contaminants, but they become fouled by oil. The atomic layer deposition process keeps the membranes from clogging to better filter the water passing through them. "With this technique, they can keep using that water," Harvey said. "This could be a direct replacement for filter units they're using today." The method could also help in oil spill cleanup efforts. In an oil spill response, diesel fuel is used as a cleaning agent on pipes and containers, which leaves a waste of diesel mixed with oil and dirt. But pipe and container surfaces treated with the oxides could just be rinsed clean, noted Darling. Darling, who also invented the Oleo Sponge, a material that can soak oil out of sea water, said he thinks the two technologies could be used in concert for future cleanups—and also for a host of things that he and his fellow scientists probably have not thought of yet. "One thing I learned from the Oleo Sponge is that you can't envision all the possible applications at the beginning," he said. "We anticipated interest from oil companies, but we've also heard from the cosmetics industry and from sporting goods manufacturers. So I suspect once this gets out, people will also come up with applications we never imagined."